My focus is going to be knit fabrics used for children’s clothing. The first thing you’ll have to decide is what TYPE of fabric you are looking for. The most common fabric for my patterns is JERSEY but you may also need RIBBING, INTERLOCK, FRENCH TERRY or SWEATSHIRT FLEECE. Shop according to the pattern you are following, warmth you want, or stretch you want. 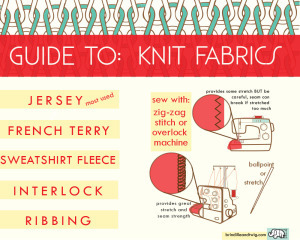 For a beginners guide to knit fabrics check out this infographic. 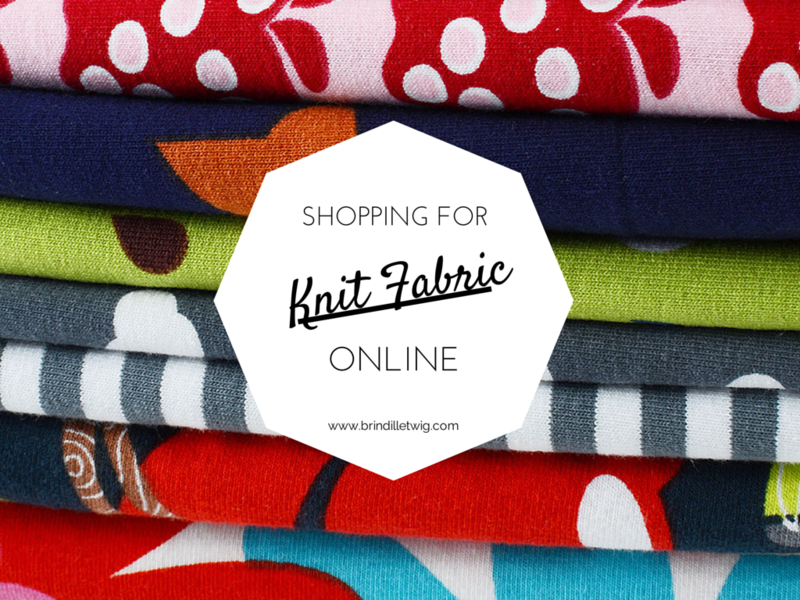 After you decide what type of fabric you need, you will want to shop by FIBER CONTENT. This is all according to personal preference. For natural fabrics look for cotton (organic or conventional), bamboo, wool or silk. I get the best results when I buy fabric with a combination of cotton and elastane AKA: Lycra or Spandex. 5%-7% elastane seems to be a good, standard amount. JERSEY that is 95% cotton/5% lycra is 90% of my fabric stash! I also like using RIBBING and INTERLOCK made from cotton and elastane. For synthetic fabric you will see polyester, rayon or nylon. Polyester is frequently mixed with cotton. 50% poly / 50% cotton is a commonly used fiber combination for t-shirts. I don’t use polyester much for clothes that need to be stretchy because it ends up fitting tight. It doesn’t stretch as well as cotton/elastane. If I use it, I sew one size larger than normal. Rayon will give fabric a silky feel. Nylon is used a lot in dance and swimwear fabric. You should also pay attention to the WEIGHT of the fabric. Make sure it’s not more sheer or thick than you want. 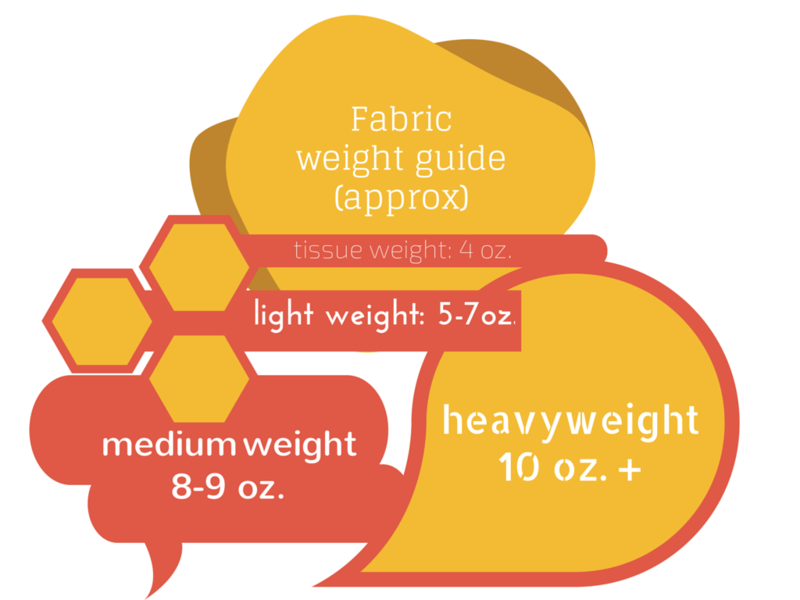 Weights will vary a lot because of fabric width, different weighing techniques etc… But here’s a starting point, use it as an approximate guide. It’s much more fun to look at color than black text so I laid it out here in a colorful way. JUST FOR YOU! After finding which fabric you want, it is always best to get a sample, especially if you will be buying a lot of yardage or if it’s expensive fabric. One more thing to pay attention to is the technique used to make the prints if you are buying printed fabric. Commonly used are pigment inks and reactive dyes. I try to only buy dyed fabric because it doesn’t fade much, if any. The pigment ink prints have always faded too much for my liking. URBAN KIDS FABRICS She sells my favorite brand, PaaPii. FABRIC BONITA on Etsy. Based in South Korea and has a lot of fun prints! DAWANDA. Search ‘JERSEY’ in the search box and go to the ‘supplies’ section to find fabric. This website can be a pain to order from but they have by far the most selection I’ve seen. NATURES FABRICS I like to keep an eye on this site. It’s a little hit or miss but sometimes you can find some awesome fabrics! GIRL CHARLEE She always has a lot of selection as well. Very affordable options. EBAY Can’t forget Ebay. They have random and sometimes great fabrics! ETSY Of course Etsy. There are plenty of shops selling high quality knit fabrics. Good luck on your fabric search! It never ends… FYI.